Dr. Hermann is committed to being a resource for comprehensive cardiovascular health care. 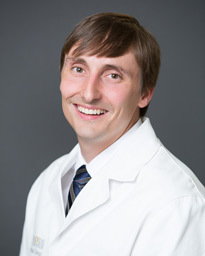 His number one goal is to improve his patients’ cardiovascular health and quality of life. Dr. Hermann focuses on comprehensive heart health — including prevention, diagnosis and treatment programs, as well as innovation in cardiovascular research and education to provide patients the latest technologies. Dr. Hermann treats patients for a wide array of cardiovascular conditions, including heart valve disease, peripheral vascular disease and coronary artery disease. His clinical interests include invasive and interventional cardiology as well as minimally invasive radial heart catheterization, which allows the heart catheter to be inserted through the wrist instead of the leg, allowing faster recovery time and fewer complications. Dr. Hermann has received advanced training that allows for treatment of complex cardiovascular conditions using minimally invasive, endovascular, catheter-based technologies. He is experienced in new treatment options for aortic stenosis (Transcatheter Aortic Valve Replacement) that allows for a new heart valve to be put in place without the need for open heart surgery or general anesthesia. He's also trained in the percutaneous closure of holes in the heart (PFOs and ASDs) by accessing the veins in the leg, and again, avoiding the need for open-heart surgery. Dr. Hermann is passionate about getting to know his patients and working with them one-on-one to help them manage their conditions. He believes in the strength and importance of establishing meaningful patient-physician relationships and feels these are instrumental to successful long-term positive outcomes. Dr. Hermann calls Edward a “miracle” patient because not many people survive a cardiac arrest without some degree of brain injury. “I can’t stress enough how important it was that his wife began CPR within minutes of his collapse. For each minute blood isn’t pumping to the brain, you run the risk of lasting neurological impacts. For Edward to be able to walk, talk and carry on a normal life is truly remarkable,” says Dr. Hermann. In the treatment and recovery that followed, he became a patient of Dr. Daniel Hermann, a cardiologist with Memorial Hermann Medical Group-Memorial City Cardiology. "Not only did she save his life, he's really neurologically... he's the same man," Hermann said. "That's just a huge, huge, save. Really, it's a miracle." After his body was returned to a normal core body temperature, Daniel Hermann, M.D., a cardiac disease specialist with Memorial Hermann Medical Group Memorial City Cardiology, discovered that Edward not only had problems maintaining a regular heartbeat, but also had a blockage in his left anterior descending artery, also known as the ‘widowmaker artery’ due to the often deadly nature of heart attacks caused by blockages to this artery.